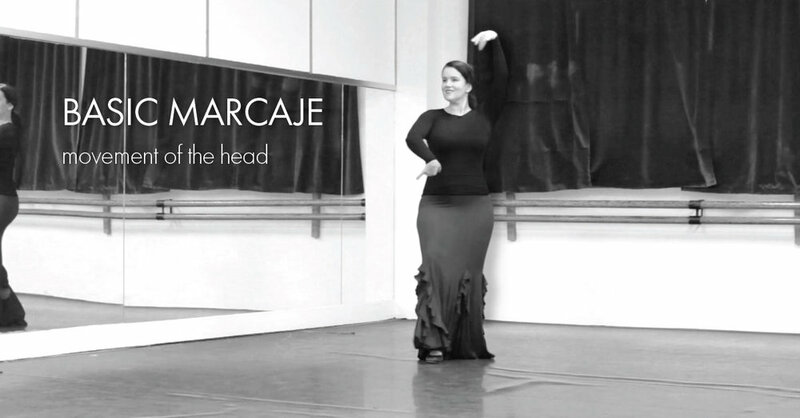 The movement of the head for this marcaje is very small but if you are not accustomed to it it can change your perception of a step completely. It is not uncommon to lose your balance, your sense of direction, your coordination. The list goes on. So the best way is to start slowly and once again define the exact movement and effect that you are trying to achieve. Then when you practice you can practice deeply with a specific goal or outcome in mind. Firstly, lets define how we'll move our head for this marcaje. The head will follow the arm that opens to third position and turn to the same diagonal (eg. right arm, right diagonal) before coming back to face front. It seems like such a simple thing but actually only moving the head to the diagonal is tricky for many of us. The head reaches each position with the accent of the rhythmic cycle we're working in. In this case it is a three beat cycle with the first of the three beats as the accent. Moving the head towards the diagonal will be slightly easier than bringing it back to centre. When the head comes back it will be the last to move after the arms (and later the feet). This gives the movement more power. Have a look at the video below to see this more clearly. It looks quite robotic doesn't it? In the beginning this is ok. You need to create a new movement pattern in your body so working in this manner is very helpful to start connecting everything together. Did you notice the timing of the head? This is a subtlety that I re-learn in every class that I have with José. It makes such a difference to the step. It gives it some pelizco. Pelizco is hard to explain. In english it means 'pinch', in flamenco it is a certain something that you can't quite put your finger on but you know it when you see it or hear it. I've asked José for an explanation, he just shakes his head at me. Now let's add in the feet with the arms and head that we have just practised. If this felt more difficult you are not going crazy, it really is a step up. How did moving all three things together make you feel? Did you notice you had more control on one side than the other? Did you start swaying or twisting? Ok, now let's put in the hand movement that brings everything together. The next video is a a longer one that goes through each of the stages above and then finishes with the final marcaje. Do you have any questions you'd like to ask? Leave a comment below.